Barbara Freethy is the best-selling author of 28 novels ranging from contemporary romance to romantic suspense and women’s fiction, many of which have appeared on the USA Today and other national bestselling lists. She is a four-time RITA finalist and a one-time RITA winner. Her books have also received numerous other awards, including the National Readers’ Choice Award and numerous honors from Romantic Times Magazine. Her most recent books, SUDDENLY ONE SUMMER, ON SHADOW BEACH and IN SHELTER COVE are currently in bookstores (part of her ongoing Angel’s Bay Series). The fourth book in the series will be released in January of 2011. 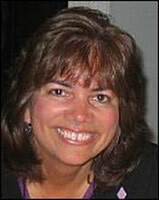 Barbara resides in Northern California with her husband and two children. For more information on her books, visit her website. You can also follow Barbara on Twitter or chat with her on Facebook. Take a romantic journey with Barbara Freethy to Tucker’s Landing, Oregon, where Sam and Alli Tucker have made a life together … a life about to be tested by the return of the only woman who can break them up … Alli’s sister, Tessa.